I think both of these guys will make the team, assuming No. 9 doesn't get traded. Yes, it's dumb to project what the Eagles' roster will look like when we're only in May and we've seen just one OTA practice so far. Still, guessing on a 53-man roster does provide one way of looking at the roster in terms of camp battles to watch, as well as where the team is positionally strong, and where it is weak. So, what the hell? Since we're heading into the second week of OTAs on Tuesday, let's just do this. 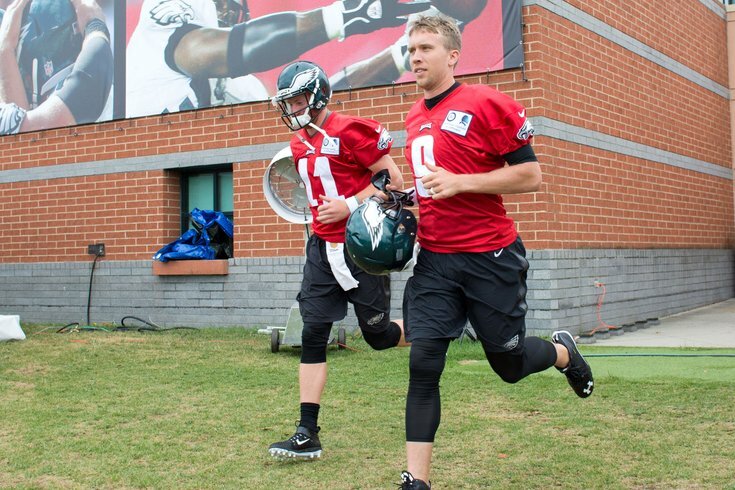 We'll see if the Eagles deal Foles before the start of the season. They are certainly willing, but will another team out there meet the Eagles' trade demands? The first three running back spots are set, with Ajayi, Clement and Sproles certain to make the team. The fourth running back spot will be a battle between Jones, Donnel Pumphrey, Wendell Smallwood, and undrafted rookie Josh Adams. I'll give the Jones the early lead. I'm interested in seeing what free agent signing Markus Wheaton still has left, but for now we'll leave him off. Richard Rodgers is a solid No. 3 tight end with experience, but his spot on the roster isn’t guaranteed. To be determined if a younger guy like Billy Brown can beat him out. The Eagles worked out Pryor both at guard and tackle during the first OTA practice, which was interesting, and perhaps an early check mark in his favor. We'll assume that Timmy Jernigan will start the season on the NFI (non-football injury) list, which will free up an extra roster spot. In reviewing the Eagles' undrafted free agent signings, one of the standouts to me was USF's Bruce Hector. He's my early dark horse to win a roster spot. We'll see if the Eagles add another veteran linebacker after losing Paul Worrilow for the season with a torn ACL. If so, that could be bad news for Joe Walker. If one of the corners goes down, a name to watch is De'Vante Bausby, who has good size, NFL experience, and played well on the first day of OTAs. Because the Eagles only had five draft picks (and one of those picks in Jordan Mailata likely to land on the practice squad), that will open the door for an undrafted free agent or two to make the team. Like Bruce Hector above, I liked what I saw of Jeremy Reaves when evaluating the Eagles' undrafted free agent class, and he was working with the second-team defense in OTAs. Obviously, Corey Graham is not currently on the roster, but I suspect he will be soon, probably around mid-to-late June. None of these guys have any competition in camp.